Restaurant Management: Bar Stools with or without Armrests? Restaurant Management: Barstools With or Without Armrests? If you run a restaurant or bar, here’s a choice you might not have considered: Should you use stools with armrests or without armrests? How much room do you have at the bar? How many people do you want to fit? Stools with armrests take up more space. This is fine if you have room, but if space is tight, look at stools without armrests. Are most of your guests regulars, who like to settle in and be comfy? Or are your customers always changing (travelers, for example)? 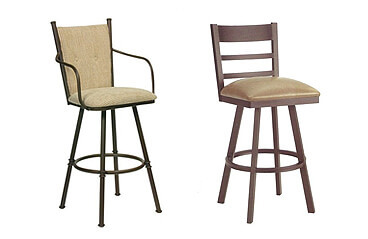 Barstools with armrests will give your regulars – or potential regulars – a reason to come back. Similar to the point mentioned above, a customer will stay in a comfy seat longer than a less comfy seat, reducing customer turnover on a single night. Wooden stools without backs or armrests are good if you don’t want people camping out at your bar for extended lengths of time. But if you like to have your customers sit at your bar and watch the game while ordering drinks and food, stools with armrests will help keep them at the bar. Simple stools are easy to move out of the way if you switch from dining to dancing after the dinner hour. Heavier stools with armrests? Not such a quick or easy change for your staff. Simple fact – it takes more time and supplies to clean a stool with armrests than to clean a stool without them. You’ll have to run the cost calculations on your own, but consider this: One stool might take two or three squirts of cleaner, while a basic stool might take one. It might take a bartender 15 seconds to clean a stool with arms, but only 5 seconds to clean a basic stool. And the stool with armrests will get dirtier – especially on wing night – adding to cleaning time. Depending on the size of your business, those small differences can add up over a year. So, what’s it going to be? We have both types, ready to ship right now.